Difference between revisions of "Venceslo-Fifth Ward International Airport"
It is one of [[FliHigh Airlines]]' two main hubs on the New World, the other being [[Southwold International Airport]]. It is also a focus city for [[BluAir]], [[CentralJet]], and [[Infamous Airlines]]. VFW was the first brand-new Governor airport on the server since [[FYI]], and is the closest Governor Airport to cities and towns such as [[Whiteley]], [[Urbisan]], [[Downsview]], Genesis, [[Bardot Springs]], and even [[Schillerton]] and [[Mallison]] — hence the airport’s slogan, “The Gateway to the Southwest.” It also holds the title of the only commercial-use diagonal runway on the New World. VFW was the first brand-new Governor airport on the server since [[FYI]], and is the closest Governor Airport to cities and towns such as [[Whiteley]], [[Urbisan]], [[Downsview]], Genesis, [[Bardot Springs]], and even [[Schillerton]] and [[Mallison]] — hence the airport’s slogan, “The Gateway to the Southwest.” It also held the title of the only commercial-use diagonal runway on the New World, until it was removed and replaced with a traditionally shaped runway to make room for Concourse D.
The airport is served by the [[VMet]], and the [[STC]] <K> line. It is walking distance to the [[MRT Zephyr Line|MRT]] as well, all allowing for near-seamless connections to nearby cities and towns. VFW: The Gateway to the Southwest. 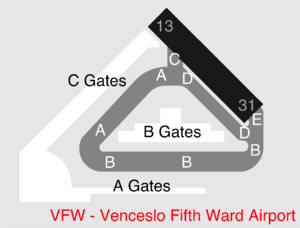 Venceslo-Fifth Ward International Airport, also known as Venceslo Airport or popularly known as VFW, is a medium-size airport that services the City of Venceslo, as well as the majority of the Southwest/Fifth Ward area of the server, hence its name. It was built predominantly by time2makemymove, and is run by the Venceslo District Association of Governments (VenDAG). It was built to function as Venceslo's primary airport, and to further this notion, UAV, the city’s Senator airfield, was demolished. There are four concourses: Concourse A, B, C, and D. There are 51 total aircraft gates and a number of dining options at the airport. It is one of FliHigh Airlines' two main hubs on the New World, the other being Southwold International Airport. It is also a focus city for BluAir, CentralJet, and Infamous Airlines. 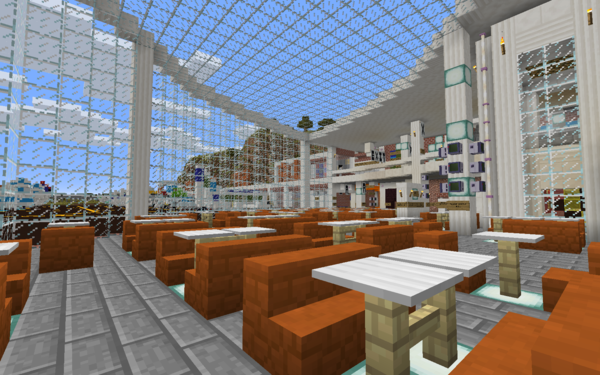 VFW was the first brand-new Governor airport on the server since FYI, and is the closest Governor Airport to cities and towns such as Whiteley, Urbisan, Downsview, Genesis, Bardot Springs, and even Schillerton and Mallison — hence the airport’s slogan, “The Gateway to the Southwest.” It also held the title of the only commercial-use diagonal runway on the New World, until it was removed and replaced with a traditionally shaped runway to make room for Concourse D.
The airport is served by the VMet, and the STC <K> line. It is walking distance to the MRT as well, all allowing for near-seamless connections to nearby cities and towns. The airport has zero helipads. There used to be three occupied ones, but they were demolished in lieu for a future expansion of VFW's central terminal. Waterville Municipal Airfield Good Service! A3 Veolia Airways VEA001 Schiphol International Airport Good Service! A4 Waypoint WP026 Epsilon International Airport Good Service! Achowalogen Takachsin-Covina International Airport Good Service! Murrville Regional Airport Good Service! A8 IntraAir IA94 Segville Airport Good Service! Fort Yaxier International Airport Good Service! 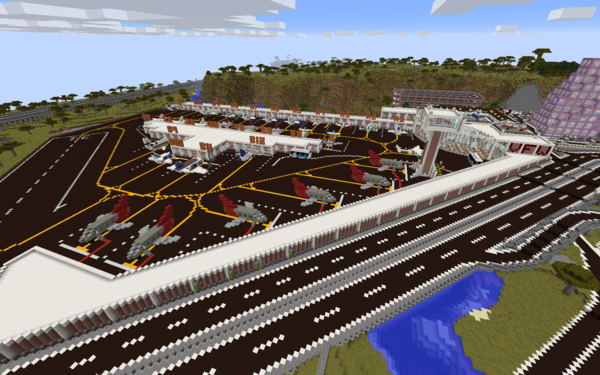 A10 FlyCreeper FC001 Creeperville International Airport Good Service! Espil Ecilidae Airport Good Service! Elecna Bay International Airport Good Service! Freedon Silverwood International Airport Good Service! B5 SkyRaven SR2 Norwest Airfield Good Sevice! B6 CentralJet CJ002 Airchester Airfield Good Service! B7 CentralJet CJ001 Welsbury Regional Airfield Good Service! B10 FlySubway FS001 Titsensaki Regional Airport Good Service! Dabecco Regional Airport Good Service! B12 Caelus CL37 Horizon National Airport Good Service! B13 BenAir BN112 Omerah International Airport Good Service! Titsensaki Sealerwhale International Airport Good Service! Whitechapel Sky Harbor Good Service! B16 South Weast Charter SWC1752 Jimmy Doolittle Regional Airport Good Service! C3 FliHigh Airlines FH12 Freedon Silverwood International Airport Good Service! North Haven Riverside Airfield Good Service! C5 FliHigh Airlines FH16 Richville City Airfield Good Service! Woodsdale Municipal Airport Good Service! Zerez Capital Airfield Good Service! C8 FliHigh Airlines FH36 Fort Yaxier International Airport Good Service! Murrville Kekkomatic Airport Good Service! D2 FliHigh Airlines FH10 Utopia-Jimmy Doolittle Airport Good Service! West Mesa International Airport Good Service! Sunshine Coast Cacto Airport Good Service! D5 FliHigh Airlines FH66 Carnoustie International Airport Good Service! D6 FliHigh Airlines FH70 Marblelake Heathrow International Airport Good Service! Birchview Leydon Airport Good Service! D8 FliHigh Airlines FH56 Larkspur Frankford Airfield Good Service! D9 FliHigh Airlines FH60 Washingcube Airfield Good Service! D10 FliHigh Airlines FH62 Kantō International Airport Good Service! D11 FliHigh Airlines FH64 San Reinoldi-Fernando Savater International Airport Good Service! D12 FliHigh Airlines FH68 West Calbar Regional Airport Good Service! VFW has an ample assortment of Dining and Airline Lounges.